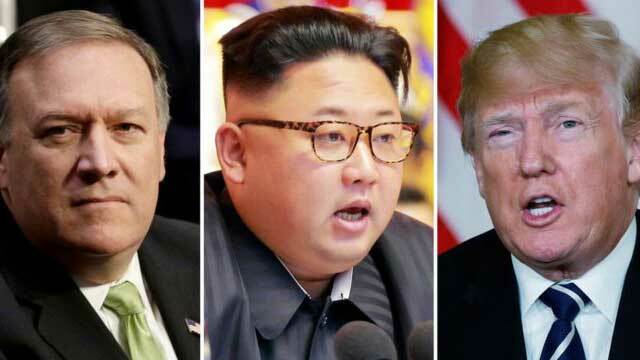 Washington, Apr 18 (Just news): CIA director Mike Pompeo travelled to Pyongyang for a secret meeting with North Korean leader Kim Jong-un, US media report. South Korea has also signalled that it may pursue a formal resolution of the conflict. South Korea's President Moon Jae-in and Mr Kim are scheduled to meet at the end of April. What do we know about the 'secret meeting'? The news that Mr Pompeo had travelled to North Korea for a clandestine meeting with Mr Kim was first reported by The Washington Post. The trip took place shortly after Mr Pompeo was nominated by Mr Trump to replace Rex Tillerson as secretary of state, two anonymous sources "with direct knowledge of the trip" told the newspaper. Later the Reuters news agency said the report had been confirmed to them by senior officials. The White House has not commented. Very little is known about the talks other than that they were to prepare for the forthcoming Trump-Kim summit. Mr Pompeo is predicted to be confirmed as the top US diplomat by the Republican-controlled Senate in coming weeks. This is despite mounting speculation that he will, unusually, fail to receive the backing of the bipartisan Senate Foreign Relations Committee following a grilling of more than five hours by the committee last week. How do the US and North Korea communicate? The US does not have diplomatic relations with North Korea, although diplomats have visited in the past and there are some so-called "back channels" used to communicate with Pyongyang. Mr Pompeo's trip was the highest level meeting with a North Korean leader since 2000 when then-Secretary of State Madeleine Albright met Kim Jong-il, the father of the current leader, in Pyongyang. In 2014, the then-head of National Intelligence James Clapper visited North Korea in a secret mission to negotiate the release of two US citizens. Mr Clapper did not meet the North Korean leader during his trip. When and where might a summit take place? Mr Trump stunned the international community last month by accepting Pyongyang's suggestion for direct talks. It would be unprecedented for a sitting US president to meet a North Korean leader. He said the summit would take place either in early June or "a little before that" and that several sites were under consideration but that none of them were in the US. Analysts have speculated that a location for talks could be the demilitarised zone between North and South Korea, Beijing, another Asian country, Europe or even a vessel in international waters. North Korea has been isolated for decades because of its well-documented human rights abuses and its pursuit of nuclear weapons, in defiance of international laws and UN sanctions. It has carried out six nuclear tests, and has missiles that it says could reach the US.